Hello, Hello! Welcome to the thread where I, Daniel, will be completing my Simple Soarer for FTFC March Madness! and finally, to glide it for over one minute. I think this is a decent challenge for myself considering i have never flown an rc glider before. I know a few big hills to fly off of but getting lift will be difficult considering it is winter. Welcome to the Challenge. I can'y wait to see this. Good luck and remember Pictures... Lots of those. yep! a time lapse and lots of pictures and a description of how i enlarged the plans and the process of building it. i started making progress on this process. this video shows that paint can water proof just as well if not better than the other chemicals he tested. i decided to try this out myself. i got 3 pieces of scrap foam and labelled them. next i got the chemicals that i was going to test. i used minwax polywhateveritis and a can of bright red spray paint that i use on rockets so i can spot them and the last thing was the aerosol spray version of minwax which i had yet to see anyone test. the first thing i noticed was that the spray paint actually started eating the foam on the exposed edges. the others were fine. i accidentally dropped the spray minwax one in a puddle but it didnt affect it. i let them dry after the second coat (although the paint was still a bit sticky) and then put them inside 3 cups of water. 15 minutes later i got my results (which are yet to happen. going to check on them momentarily but i am going to post this first bc i dont want to lose it if my laptop crashes). just wondering, should i make this into an article? i havent seen anyone test spray minwax before so i might help a person, maybe 2 or 3 if im lucky! another question, can i make an article just showing a build even if it is just the generic following the plans build? or is that just cluttering up the site? so the results are in. 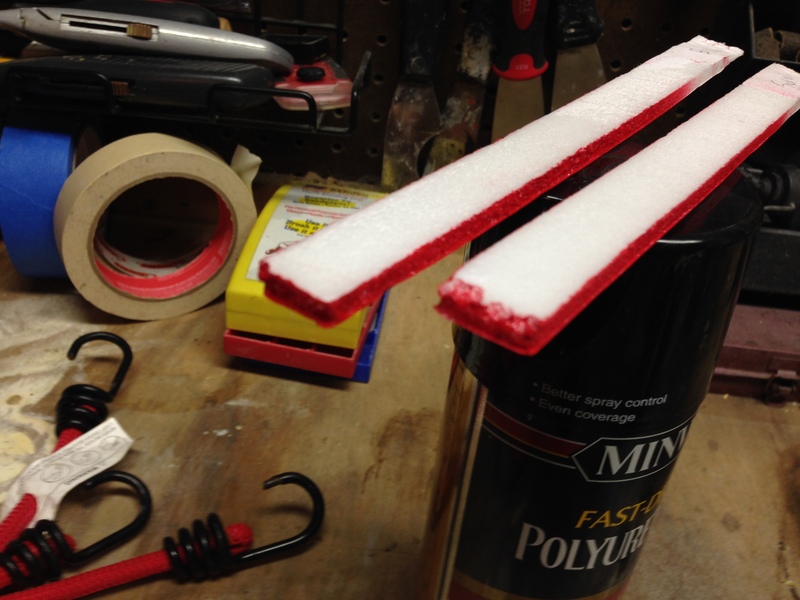 spray paint eats the foam and brush on minwax works better than spray. the below picture shows how bad just spray paint was. the foam started dissolving on the edges and the paint even leaked through the paper and started eating the foam under it. the paper peeled off at the edges very easily. when you spray paint over the minwax it will still eat the foam on the edges a fair bit and it will cause the paper to stick to the foam even less. 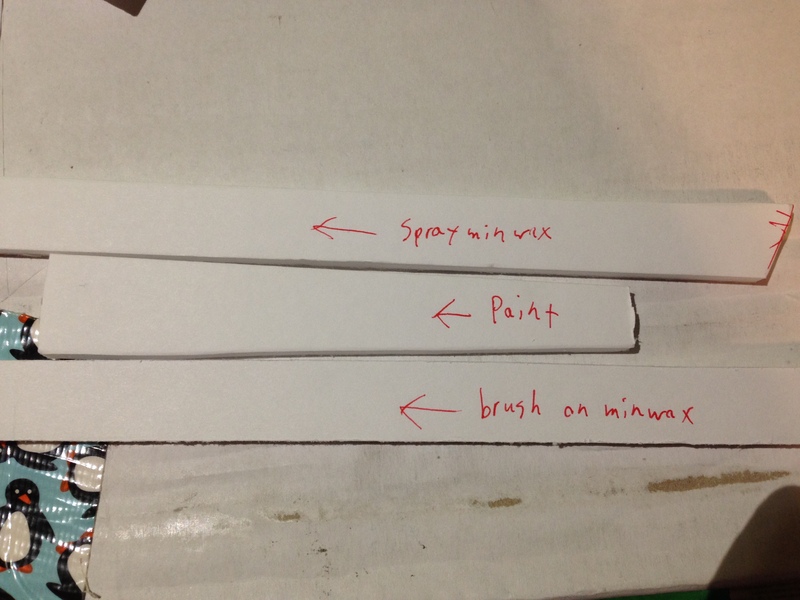 in the above picture, the paper that is painted is removed so you can see if there is damage under it. the piece of foam more towards the right and bottom is the spray minwax and the top left ish one is the brush on can of minwax. for this project i will be using the can or brush on minwax for as much of the plane as i can and i will then use only a small amount of spray paint as markings for orientation and try my best to NOT get the paint on the edges of the foam board. PS: i have way more pictures and a few videos of this test but it keeps giving me an "image failed to upload" message so i cannot post them. sorry. i have used the minwax on my simple soarer. there will be a post about that in my simple soarer build thread shortly (a few days probably). i just used a paper towel and did the "wax on, wax off" thing lol. did i mention it is sticky? 1 Minute should be very achievable, even in winter. My Simple Soarer has been getting 20 second flights at my local park hill with no wind. I actually just got back from flying earlier today and almost hit 4 minutes slope soaring it, 3:58 a personal best. It's about 40 degrees out today with gusts forecast to 10mph, though I think they were a bit stronger than that. I recommend reinforcing everything. I added 1.5" sections of BBQ skewers on the fuselage under the leading edge of the H-stab as it likes to break here. Popsicle sticks along the fuselage at the aft end of the battery hatch also reinforce a weak spot. The last place everything breaks is right where the aft wing skewer pierces the fuselage; the fuselage had ripped through here in almost every hard landing I've had. Let us know how it goes and if you need any advice/help. thank you for the advice on reinforcements. i have had similar weather today. i think i may try to fly it at the beach on friday if all goes well. good Luck Daniel! Have fun and I can't wait to see it. thanks! i want to paint it soon but i just came down with a bad cold. i hope it clears up soon so i can do the painting and get to flying.